An Intelligent environment can be defined as an environment in which intelligent devices are trying to make the life of the inhabitants of the environment more comfortable. In the present case, a device's intelligence means its ability to independently process information obtained from the surrounding environment. According to the intelligent house concept, maximum comfort should be created for the inhabitants of the house while economizing on resources. 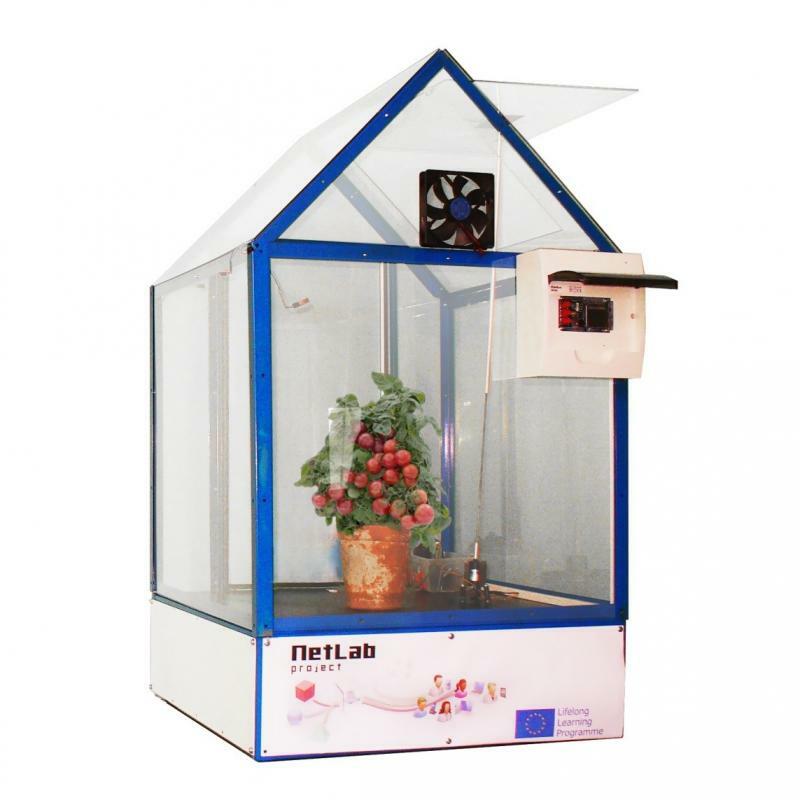 A similar concept can be applied to growing plants in a greenhouse, where the smart house concept is transformed into the smart greenhouse concept that aims to optimize growth conditions for plants and automate the growing process. auxiliary functions related to power supply, computer communication, security. Find similar solution and study theory or working principles. Sketch a drawing of the system with all of the input and output devices to get overall picture of what is needed. Determine the environmental parameters and control conditions required for growing the plant. Then choose the sensors according to the parameters. Choose the actuator devices required for opening the greenhouse hatches and ventilation. Choose a pump that will be able to water the plants in the greenhouse with a sufficient amount of water. Choose microcontroller board for input output control and smart controller board for monitoring. Determine the data exchange protocol used by sensors that were chosen and find out how to actuate these data exchange protocols on a microcontroller and if/which existing software libraries can be used. Choose a communication solution between smart greenhouse controller and server. Give the reasons for your choice and draw the corresponding schemes. Write program to collect data and send commands to microcontroller board. 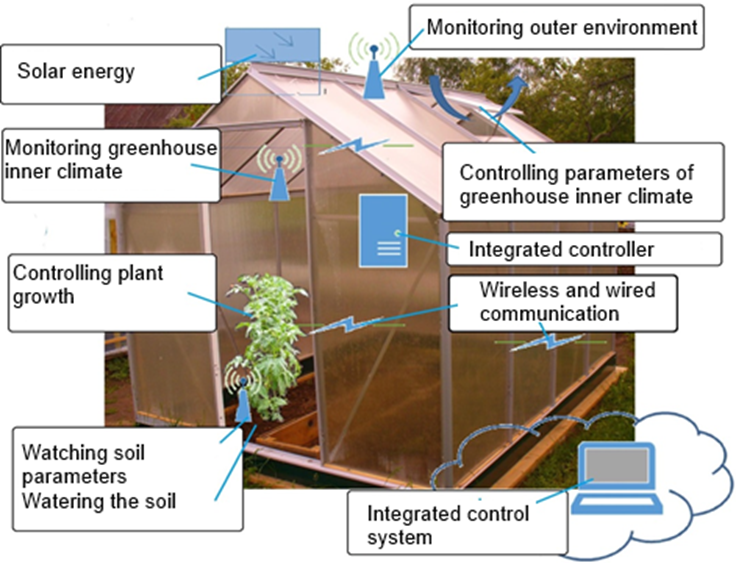 Automatic greenhouse is a complex system which needs a lot of sensors and actuators to maintain near perfect environment for the plants. The most time consuming part is writing a smart algorithm to deal with all kinds of situations that can occur. Failure to do so might end up even worse than regular greenhouse conditions. Given smart greenhouse project is only meant to control small greenhouse, but can be scaled up by adding more microcontroller boards (aka Nodes). The smart controller board does not need to be multiplied cause all of the microcontroller boards can communicate wirelessly to one device. The system can also be made better by monitoring the greenhouse for longer periods from which adjustments can be made to control algorithm.